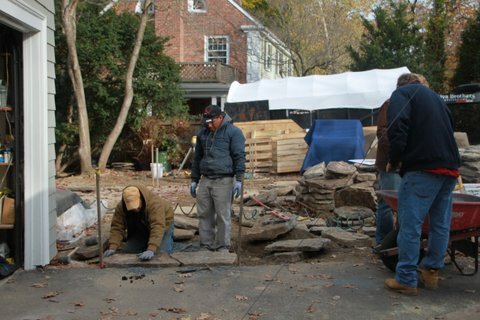 THIS OLD HOUSE: Auburndale — Nawada Landscape Design, Inc.
Jennifer Nawada Evans was selected to appear on the PBS program, This Old House as the Landscape Designer for The Auburndale Project. In this series, This Old House renovates a 1940's Colonial Revival, on Boston's famous Charles River. Jennifer created the Landscape Plan for the front of the property. The clients' wished to open up the overgrown front yard, create spaces for perennial gardens and introduce a charming, natural entrance into their home. TOH host, Kevin O'Connor meets Jennifer Nawada Evans to review her design plan and discuss the importance of native plantings verse invasive plantings, and placement for the new plant material. Once the design plans were approved, Jennifer worked with Landscape Contractor, Roger Cook, to oversee the installation of the walkways, plantings, sod and the planting of the neighborhood trees in the community island.